Anticipation: Where's your next trip? Few things live up to the excitement of waking up on Christmas morning when you are a kid. Buying a plane ticket for a vacation, the grown up version of Santa’s big gift under the tree, might come close. People care not for the airlines but there is an undeniable tremor of delight every time you book a trip (business and bereavement travel excluded.) Once your flight is booked or some other measurable (ideally non-refundable) step is taken towards planning a trip, anticipation sets in and carries you toward your departure date. Even the airlines stoke our excitement by believing we may have as many as 6 email addresses to share our itinerary with. Anticipation may be the least documented portion of your journey but it’s no doubt the frame in which your experiences will fit into. Planners will engross themselves into guidebooks and maps and travel underwear. Dreamers will immerse themselves through books, music, or movies set in their destination. Connectors will reach out to their friends and friends of friends and the grocery store clerk for tips. Fly-by-the-seat-of-their-pantsers will assume their travel companion is taking care of things. Most everyone will look at pretty pictures, choose one as their screen saver, and drool until touch down. Social media junkies will then “check in” at the airport and continue to do so daily until they’ve returned to work. It almost doesn’t matter how long the countdown is as the jolt of anticipation will gladly fill the space given. “Where’s your next trip?” is also a serviceable conversation starter in virtually any social setting and infinitely more interesting than the weather. Strangely, people are often more interested in where you are going than where you’ve been. A cynical view of this might be that’s because we have short attention spans but maybe it’s because anticipation is largely all reasonably positive and retell is too many details edited either for only the AMAZING! or every horrible thing done to you in a place like the Maldives. Also there are no photo albums to endure during pre-trip conversations. Reality should not temper the golden hues of anticipation. We need the fantasy to go through the hassle of leaving our house and handing over our credit cards. Home base is full with enough reality that you shouldn’t care if the award winning photo of your destination has cropped out a power plant in the distance or that the darling monkeys you’ve read about will cease to be cute after 15 minutes. If aware, the anticipation buildup can be a kind of goodwill that might actually come in handy when the reality on the ground isn’t mapping to the pretty picture. Because anticipation does however raise the expectation bar, it does behoove you to KNOW THYSELF when planning a trip. If you like to be led and cared for, pre-book with a tour group. If you hyperventilate in crowds, skip Florence in July. If history bores you to tears, you won’t be cured by sacrificing a day in the Churchhill War Rooms because someone included it in a list of “Top 5 Things Not to Miss.” If you have children, remember you have children. Resilience training does not happen on the fly. There was a widely-referenced study conducted in the Netherlands about the link between vacations and happiness and the conclusion was that the largest boost in happiness comes from the simple act of planning. Apparently the old adage “the best is yet to come” does not necessarily apply to vacations. Even though happiness peaks before you’ve reached 10,000 feet, the happiness halo returns to baseline roughly 8 weeks after a trip. While this may sound discouraging a better takeaway is perhaps to take shorter, more frequent trips so that you have something on the horizon. Anticipating a trip is obviously easier with both financial resources and in places with more liberal vacation practices than the US. The Netherlands study showed however that the happiness boast isn’t linked with how far, long, or luxurious the travel but rather simply planning a break away from your normal routine. While the study didn’t suggest this, my own experience proves that the payoffs for planning a trip to the overlooked and less traveled places are almost always higher. So while I can’t guarantee that planning a weekend getaway to Waco, Texas will yield an 8 week happiness halo it’s worth a shot. I love me a good lifey quote. When there’s one that stops me in my tracks and gets under my skin I often write it down in my journal. Writing it down feels like a silent activation from the page to my brain. Of course the next day there is a new page with new thoughts and chicken scratches along with the demands of life that bury what came before. On the rare occasion I look back over my journal, I re-encounter many of those inspirational quotes and think, “Oh, yeah. That was good.” but when I scan for evidence on how I’ve actually applied it, it’s almost always underwhelming. Activation of a good word in the flow of everyday life needs more than a ball point pen. I have this ring a dear friend gave me a year ago inscribed with a verse from the Bible (Philippians 4:8) that speaks to our thought life. It says, “Finally brothers and sisters whatever is true, whatever is noble, whatever is right, whatever is pure, whatever is lovely, whatever is admirable – if anything is excellent or praiseworthy – think about such things.” That’s a lot of words to get on a ring, folks. So tiny is the writing that it’s been easier to commit the thing to memory. Aside from my wedding ring, I’ve had no consistent jewelry habits. I can’t even manage a regular watch. But even though this ring is nothing particularly special, I’ve mysteriously found myself wearing it almost every day for the past year. Wearing it feels like a kind of armor. I instinctively touch it whenever I feel my thoughts going down a rabbit hole of negativity and the good quote activates. It’s been a gentle, real-time reminder in the flow of life that there are many other things – at least 8 other things with a wide open “whatever” preceding them - I can choose to be thinking about. Although I’m still not sure I’ve had any riveting noble thoughts. The real benefit however is when the new thinking spills over into modified behavior. It may sound silly but I’ve noticed how the mere twirl of my ring can re-center me at the precise moment I feel on the verge of popping off into complaint or cynicism. Not every time (obviously) but enough to be detectable. This little piece of silver around my finger has been more instrumental in applied living than anything I’ve written down in my journal. I imagine some people have tattoos for a similar reason. It’s probably why I still remember putting on the Armor of God – which included a shield and a breastplate! - from my days in Sunday school. We have an enormous capacity to remember things but our reflex to access those things in stressful situations could do with some reminding. It’s got me thinking about the method of loci, the memory technique whereby you place information to be remembered at a point along an imagery journey route. Typically the technique to remember something like a list of groceries uses a route through your house and you associate each room with a piece of information to be recalled at the store. I always felt like that was a dumb example because why would anybody go through the mental gymnastics for something they could write down on a list. I can remember milk. Remembering to Be Kind Always, like while driving or on Facebook, needs nudging. If enough of these type of voices auto-played as we moved through the world in our bodies, I have to believe it would be detectable in our interactions. It’s exciting to think about how many truths we can tuck away in the palace of our bodies. I’m reviewing my journal now and making assignments. If anyone has a suggestion for arm pit, I’m all ears. I have no idea how far an average 9 year old can (and should) run. Until today I might have taken the token elementary school “one-mile run” benchmark, grossed it up for good measure and said 2 MILES. In fact I invoked that line of thinking when my 9 year old insisted he wanted to join me on my run today. Thankfully my day’s training schedule called for a short 4 mile run so having him run HALF of that with me seemed like a worthy goal. Training to run a marathon in a 45 year old body not wired for sustained efforts of self-discipline has a way of loudly intruding on family life. On days when I have a double digit mileage target I’m both out of the house for hours and then talking about my recovery, requesting foam roller massages and affirmation for the remainder of it. It’s hard for my boys to miss this Marathon business is kind of a big deal for their Mom. They’ve been really sweet about it. 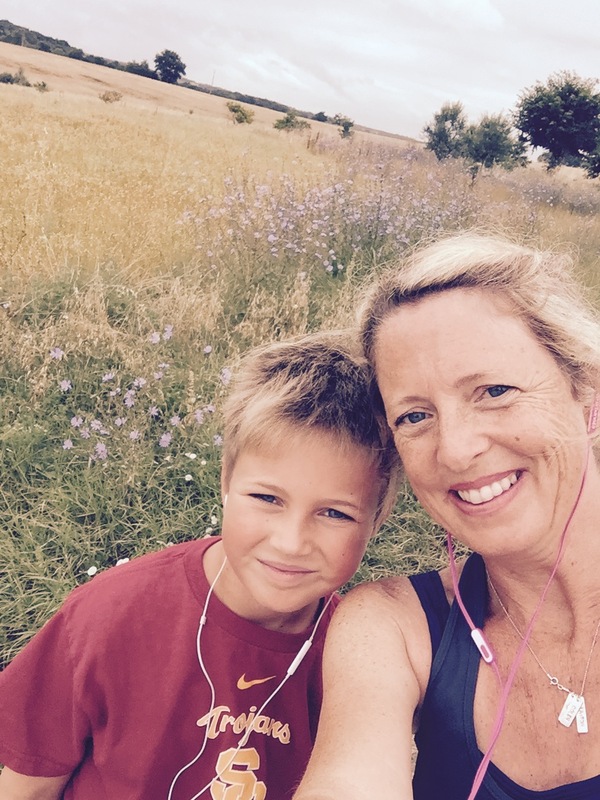 So there we were today – earbuds in– embarking on our inaugural mother/son 2 MILE run. Heightening this already big milestone was the fact we were doing it in the picturesque if not relentlessly hilly French countryside and aided by an unusually cool morning after a night of rain. We started out on a confidence building downhill. By 0.4 miles there was talk of it “being easy.” By 0.8 miles there was the question of how far his 13 year older brother had just run on his own. (Answer: 3.8 miles at a much faster pace than his Mom.) By 0.95 miles, as I expected there might be, there was the bold declaration that he was not yet ready to turn back. He wanted to go the full 4 miles with me. When I suggested maybe 2.5 or 3 miles he would have none of it. By 1.8 miles the “easy” talk had subsided and that’s when it got interesting. Over the next 2.2 miles I taught him all the strategies I’ve learned. On the steep uphills I told him about leaning forward into the hill and not letting it work against you. When he got a cramp in his side, I suggested he have a word with the cramp and tell it to please leave him alone. I taught him how to relax his arms. I taught him how to slow his pace so he could go longer. I taught him it’s okay to stop and stretch for a minute. And when he was really gassed I reminded him to focus on one foot at a time … to which he said, “Like that show Unbreakable where Kimmy says you can do anything for at least 10 seconds.” Exactly! And so when at 3.5 miles with a final uphill to finish my red-faced, exhausted 9 year old boy asked me in hopes of a reprieve: “Mom, are you tired?” I answered honestly, “No, because I’ve trained my body to do this … and you can do this … it’s only as far as 2 more laps around the track.” To finish would mean he would do 8 more laps – or exactly double – his personal best. He asked at every remaining driveway if it was “our” house but didn’t stop until I confirmed it was and my watch confirmed it was 4.0 miles. I still don’t know how far an average 9 year old can (and should) run. What I do know is that today mine ran further than he (and I) knew he could. Not only that but he’s asked to go with me again tomorrow. We can be content to remain as we are, we can push to reasonably sanctioned limits or we can be willing to get red-faced to go farther than those around us believe is possible. Children routinely do this better than we can so let’s give them the berth to try, pick them up when they fail and encourage them to do it again. They have something to teach us in what it means to truly be unbreakable. 10 seconds at a time. As mothers we work hard to ask our children the right questions. The ones that elicit more than an eye roll or a yes/no response. The kind of questions open-ended enough they might lead to a discussion, or if we’re lucky, a small reveal of some below-the-surface thoughts. Middle school is prime time for the exploration and formation of inner lives and yet puberty and peer orientation make it harder for parents to break in with good questions. I have some evidence. Thursday was a public holiday and so we went on a family hike. I lingered back with the 13 year old, armed with a few probes, forgetting that where brothers and freedom to pee are combined, Mothers-of-Boys and conversation are sure to lose. “Cool, thanks” was the longest response I got. Kinder, yet still dismissive and definitely with a period at the end. As Moms we may not always get the answers to the questions we ask our kids. But I have this suspicion our kids know when we’ve been generous and sincere in the asking and they will respond with a piece of themselves. Sometimes even with some elaboration, when we are least expecting it. Can we keep asking questions? I think so. Even with the white noise of the middle school years. Happy Mother’s Day! We are leaving for Thailand on Monday. Our nine day trip to Bangkok and the beach resort town of Hua Hin on the Gulf Coast has been booked for a long time. I did all the necessary due diligence checking on visa requirements (not required if staying under 30 days), confirming immunizations with my doctor (all set), and the hard work of bathing suit planning and finding five complete sets of flip-flops. Last night my husband casually asked about travel adapters. That was a mistake. I grabbed our Thailand Guide Book and flipped to the section called “Travel Essentials.” There I found the (vague) answer about travel adapters under the heading “Electricity.” Smug with satisfaction on our preparedness for every voltage and pin scenario I casually turned the page where the next heading in “Travel Essentials” was called “Other Bites.” Where are the trigger warnings when you need them? This is the exact moment I learned that Thailand has not just any old snakes, but lots of poisonous snakes AND snakes in Bangkok?! AND venomous sea snakes meaning neither land nor water is safe and the only truly safe way to make the trip would be to spend nine days in a hot air balloon. Why? Because when you think about visiting a city of 8 million people you aren’t expecting urban danger you might step on or when you are really scared about something you try not to think about it or you think about jellyfish instead which is a danger you can handle. It’s called denial and it works well when your husband doesn’t ask you to look stuff up. Then I Googled “snakes and Hua Hin” and the search results sent my phone flying to the floor. Reading my private How-To-Cancel-The-Trip-Now thoughts knowing they were about to be made public, my husband got all tough love on me. He thought it would be helpful for me to know all hospitals are well supplied with antivenins. Positively Unhelpful. Knowing the ubiquity of medical help was essentially implying a bitten limb was all but inevitable. When he reasoned, “There are millions of tourists in Thailand and have you ever heard one say, it’s great but watch out for the snakes.” “No,” I said, “but maybe all these years of fears I’ve had about snakes is because one of my children is going to die from ….” And that was the end of our conversation last night. It’s hard to have a conversation when one person has gone apocalyptic and the other person wants to talk probabilities. I know it sounds overblown and dumb but I’ve spent decades doubling down on this irrational fear. Fear is the overbearing frenemy we let ride shotgun. And if they’ve been riding with you since you learned to drive, they were there long before you got GPS and they always think they know the best way. They can be so bossy. It started when I was 11 years old living in New Mexico where our grassy backyard bumped up against the desert and every dog on our street had had an encounter with a rattlesnake. The fear started with a real threat but has been unreceptive to new and better information in the years since. Though I’ve been told they are almost always more scared of me than I am of them, I see all snakes as a threat, not just the dangerous ones. It’s caused all kinds of mortifying situations on hikes, at the zoo, in the movie theatre. Regretfully, I’ve passed on this fear, in all its spectacular theatrics, to two of my children. So here I am today. It’s a new day. It’s also Good Friday. I haven’t spent the morning Google searching myself into a frenzy or firing off emails to the hotel with special requests and impossible questions. I’ve started to pack. I may not be able to fully restrain my fear but I can ask it nicely to move to the back seat – to the third row seat – and ask it to not talk to my children. I’ll have to make the same choice again tomorrow, and on the third day and for the nine days I’m there. I am reminded too that there will be other people on my flight facing different fears – the fear of flying or the fear of walking into a European airport terminal to name just a few – but if we don’t push through the fear we’d miss the surprise of being lifted up and taken to a new, mysterious, marvelous place. Now there’s a thought worth holding on to. Someone else - available - to get rid of it … for me. For those of you not a few weeks away from putting a deposit down on a college tuition at some institution yet to be decided, might I bend your ear for a word? You know that feeling when you are up big in a card game and then you have one bad hand where you’re left holding lots of face cards and jokers and you slide out of the lead? October until the end of the March during your child’s last year of high school – the protracted season called the college application process -- is a little like that. Get ahead now while you can. You mean well, and genuinely have your son or daughter’s best interest in mind, but sometimes your own intensity about the whole thing comes around and surprises you. Of course you’ll get tangled up in the wide ranging emotions that come with watching your child (check that: young adult!) separate from you and as a result swing from encouraging a nearby school or one in Singapore. You’ll have feelings you didn’t know you still harbored about your own college experience - some good, some bad and some completely irrelevant- but all with an urgency to be shared. You will check the mailbox like its 1988. In the early rounds, you are open to all sorts of possibilities – firefighting, Egyptology, bakery science, schools in the Deep South. You talk about stuff like finding the “Best Fit” for your kids and mean it even when you’ve never heard of the place and are pretty sure they’ve only heard of it because it’s near the beach or because a 6’10” Lithuanian got a basketball scholarship there. You swallow hard but quietly when you wonder if “best fit” is 100 miles from an airport or if a school with a Fighting Artichoke as a mascot is sufficiently reaching. Your remarkable openness lulls you into thinking you will NEVER be one of those pushy college parents. Trouble is when the rubber meets the road and you near the end of the process; you want not just the Best Fit but also the Best. Even if you were mostly hands off up until this point, you might find yourself doing “school ranking research” and emailing it to your son or daughter during school hours or even find yourself trolling sites like College Confidential or the Student Room to “gather data.” You’re not like one of those crazy Moms who posts anything there (except FB posts like this one!) but if anyone saw your browsing history one might wonder if you were the one going back to school. What is 100% sure is you will want to talk about it 10x more than your college bound son or daughter. This imbalance might be manageable if the process was compressed but when the process takes six months, you’ve all but guaranteed TOO MUCH TALKING. Secret signals with siblings is likely to follow. Add to the waiting the numbers of universities kids nowadays are applying to (like 10!) and you’ll need a matrix to keep track of all the details. The truth is you know in our your heart that Best Fit doesn’t always equal Best in the same way that sometimes progress is not a step forward but an about turn. It is possible than Best can be measured but Best Fit is a complex algorithm you can’t solve. The other, harder truth is that at 17 or 18 years old, they know themselves better than you do now and so are in a much better position to gauge which school will get them closer to the place they’re heading. So while talking and matrices might be a strategy at the twilight of your core parenting years, being in the service of good listening might be a better one. I have a few weeks left to take a dose of my own medicine. I’m open to having my browsing history checked. I am usually not a generous survey person. A lot of kindness evaporates when a solicitor calls asking for “Mr. Ball-batch” when the Mrs. is clearly on the line. I change sidewalk lanes when I see those young people with clipboards. I know all the hidden website places to find the no thanks "x." Yesterday was one of the exceptions. I got an email with a request for a listener survey on a podcast I’m quite fond of. Also the email sender’s name was Quinn, the same name as my first born, which should have nothing to do with it and yet it weirdly did. They both have two "n’s"! Quinn, the one in my email, promised the brief survey would take approximately 10 minutes. Our online selves leave conversations, which I've heard called ghosting, whenever the conversation gets hard or boring or someone’s Uncle Eddy adds something completely awkward. We leave long articles in search of the digest version or because someone posted one of those “Tasty” videos showing us everything we need to know about making Beer Mac ’n’ Cheese in 30 seconds. We get sucked into a reality TV show because for a few minutes it seems to be hitting on something genuine and then something gross turns up and we’re out. We do have to filter things online because not every article or even “Upworthy” post merits our full attention, but the problem is when our online habits bleed into our real selves. When approximately 10 minutes of face to face conversation – without a digital interruption or other tabs open- feels like a really long time. When we prematurely say “I’m out!” when the conversation takes a wrong turn or before we’ve left any space for a deeper conversation to bloom. Good conversation takes time and it takes work. It takes not giving up in the pauses or asking dumb questions to fill them. 12 years old especially do not like the dumb questions. Later that night as I sat the boys down to a rushed dinner, I was multitasking at the desk. I was busy looking for hotels in Stockholm while my older son was trying to tell me about the recent news of the Czech Republic and their treatment of refugees. I kept on with the Stockholm search (the hotel options are many and beautiful! ), but I did open another tab to BBC News to search on Czech Republic. By the time I left the hotels for the news, the conversation around the table had moved on to who had the Parmesan cheese. Yeah. Missed it. The conversation. The irony of me being the one with the laptop open at dinner. It happens. All you can do is say “I know!” and try better next time. Next time was later that night. I did the same experiment with my older son on a dark ride home when it was just us. (He too was happy to put his phone away for the car ride, but only after he texted his gf goodnight.) We did not talk about what he just texted or school or college (a favorite parent topic at the moment and a not-so-favorite topic of a high school senior.) Instead we talked about funny “only in Luxembourg” things that happened at his practice. I told him about the other Quinn and the survey and ABOUT the podcast I really like and how long 10 minutes is and he told me about “the rule of 8” he learned from his 7th grade math teacher to make me not feel so bad about aborting the survey and then we started to make up funny survey questions and we couldn’t stop laughing. We laughed all the way home and into the living room. Phones down is no guarantee you will end up in a belly laugh, but doesn’t even the possibility of it make it a 10 minute exercise worth trying? Ever have one of the dreams where you absolutely cannot do something really easy – like signing your name or making a garden salad- that in waking life you have either mastered or people of your age no longer find complicated? Then because you’re desperately trying to find the salad spinner with hungry guests waiting, you snoozed your way to getting up late. I would feel so much better if I had been trying to make puffed pastry or a long putt. Salad is my game. The problem with these silly dreams is that if you don’t take a moment to right size your beat up confidence ship and tell your mood where to get off, you’ll rush to the shower, pump the conditioner before the shampoo -again- and nick yourself shaving with one of the razors with the bumpers you spent extra money for to avoid these kinds of things. And then because you’re already late and band-aiding your cut, you won’t have time to practice your signature and prove the dream gods wrong. Unattended, dreams that question your competence are sure bets for either a sucky or super productive, list making day. I usually follow the sucky path. If it’s raining like it was the morning after, it’s all but guaranteed. For me it reminds me that I’m underemployed, unable to speak French, and a creative who studied stupid accounting. Things that on most days, I’m at peace with. Most days I know that salad is not my only game. I know, I know, it was only a dream! But I’m one of those people who a) puts a whole lot of stock in looking for signs and wonders and b) really, really needs good sleep. I know, I know, it was only a few words. But the words probably wouldn’t have been said unless quiet beat out grumble. And, if one of the people who knows you best sees your game and sees you doing it smartly and with kindness, then the dream gods have to be wrong. You know how sometimes your friend tells you, “I’ll send you the recipe. It’s so easy!” and then you open it up and think: liar, liar, kitchen on fire. I’ve dished it as many times as I’ve been served it. In fact this week I had lunch with a new French friend who I’d met at a mutual friend’s birthday brunch, over one of my raspberry breakfast crumble bars. Where there are groups of women and good china out, we do like to put our best fork forward. The fruity bars were no Coq au vin, but anytime there is a food processor and two part baking process you won’t be whipping it up during a commercial break. You’ll be calendaring it for your next assignment. Well, that was Tuesday. Today is Friday and I have a new outlook on easy. This morning I was in my kitchen at 6:50am. By 7:07am, there were biscuits. Not just any biscuit but the lightest, tenderest, tastiest golden biscuits ever to grace an Ikea plate. In places where measuring precision and light touch is required (“don’t overwork the dough” may be the most open to interpretation baking instruction ever), I have a very uneven and sometimes inedible past. But these biscuits. These biscuits were CHAMPION’S LEAGUE. My audience swooned. I briefly played the kitchen martyr. There was none left by 7:27am. The secret? Two ingredients. That’s right – two ingredients. No butter. No pastry cutter. Definitely no Bisquick for 3,000 miles. Only a wooden spoon and two ingredients: self-rising flour and heavy cream. A recipe where anyone can be a hero. I wouldn’t have believed it either except if you’ve ever made a recipe from J. Kenji Lopez-Alt from Serious Eats.com, you know this guy is serious about the science of good food. The recipe, the truly easy recipe, is called, “Two Ingredient Never-Fail Cream Biscuits.” It's not a new idea. Kenji even admitted: "But not everything worth making is brand new." After I polished off the last biscuit I hid this morning, it got me to thinking about how Jesus summed up what we needed to know by telling us to do two things: love the Lord our God *with everything* and love our neighbor *as ourselves*. That these two things Never-Fail. It seems like as we get more comfortable in our own kitchens of faith or where there is an audience to impress, we often try to add in more ingredients and over complicate the recipe. But I wonder if we tried to stick to the basics, these two ingredients, would we be lighter and more tender? One might argue that heavy cream can stand on its own. Flour, like love for your God, definitely cannot. It is an important ingredient but it can’t rise – do what it was meant to do- all by itself. It needs to be worked into the fat of relationships, the ones you choose and the ones you don’t. Then when the flour is coated in the richness of risking love, showing mercy and overthrowing self for the sake of our neighbors (here I must mention the ones we can’t find any little thing to agree about), does it finally come together into dough. It’s sticky and must be handled with care. But once the two loves are mixed in roughly the right proportions, it now has the potential to withstand the heat and produce something very, very tasty. It seems impossible your mad-o-meter can go from zenzero to wristlock in thirty seconds. In church. But they we were. It started out flowers and fresh air. We had walked there. Everyone including the Conserve Water While Showering Zealot knew better than to suggest driving on a beautiful September morning. Conservation talk cuts both ways. I hadn’t even actively discouraged the scooter. Aside from my skinny-in-the-wrong-place jeans constricting round my legs like a permanent calf raise on dumbbell shoes, it had been a pleasant approach to the pew. Truth be told, we don’t actually have pews. We have red chairs. We were even on time. Granted the service starts at 11:45am but getting a teenager, middle schooler, and a child with a lot of questions to church after Daddy’s been gone for 7 days and after an evening of wine tasting is something I think God notices. The service starts with singing, my favorite part. Within five minutes, two of my children had left their red chairs – past me on the end - in search of water. Within seven minutes, one of the water-bound children also wanted a sip of my tea, animating to everyone sitting behind us that it was too hot. Between minutes seven and eight, there was a minor sibling altercation that always looks MAJOR to a Mother mid-hymn followed by a much too vigorous refusal to switch seats because “he wanted to see what his brother was writing.” Who’s writing while we are supposed to be singing anyway????? At minute eight my eyes were closed in worship. At minute eight thirty, we were in wristlock and making our way to the back for a conversation. Unfortunately the offering was being passed at the exact moment of exit but these things happen seem to happen without much warning when you cede control to people who have chosen to sit in the almost front row. It’s probably worth noting that the “everyone sitting behind us” may have included a school teacher I have a tiny problem with for sending students- mine included -out of the class for what I can only conclude is misbehavior, asking a question or breathing too deeply. It occurred to me somewhere between the “You can never sit next to your brother in church again” edict and the rope I was now trespassing to sit in the last row of red chairs that maybe I was overreacting a tiny bit. That perhaps my big movement to the back in wristlock was more noticeable than whatever altercation preceded it. That maybe I wanted my children to behave just a little more than I wanted to worship. That maybe I cared even more with an audience, especially when the audience includes people you have a tiny problem with. Once safely in the last row, the mad-o-meter continued to register for a bit. I even tried to make eye contact with the almost front row who was carrying on writing until I realized – all too vigorous sign language confusion a clue- that maybe it was time to let it go. That maybe I should carry on letting God meet me in my red chair and my too tight jeans and ask for a change of attitude. I know he listens when we ask him for that. I know that because instead of bolting out the door at the end of the service which would have been to plan, I stopped to introduce myself to a family I hadn’t seen before. They were in fact new to Luxembourg and new to the church. I got to be their welcome. Me, the one with tiny attitude issues, who had just been welcomed back herself.